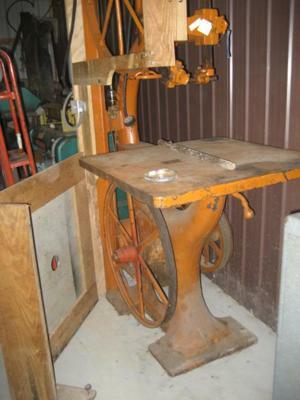 Big Old Orange Band Saw C.E. Wright Mtf. This saw is in my Father-in-law's estate. It says C.E. Wright Mfg. Co E. Orange NJ- it is cast iron I think, and has a 30" table and a 30" throat and wooden wheels (?) my brother-in-law called it a re-sawing saw. Would like to sell it but don't know what it is worth. I have more pictures and also more equipment in this estate. Not in any big hurry to sell, but we will never use it and could use the space.